The Super Bowl is approaching, and whether you're a Patriots fan (like me! ), an Eagles fan, a Justin Timberlake fan, or you just watch for the commercials, it's a very big day across the country. 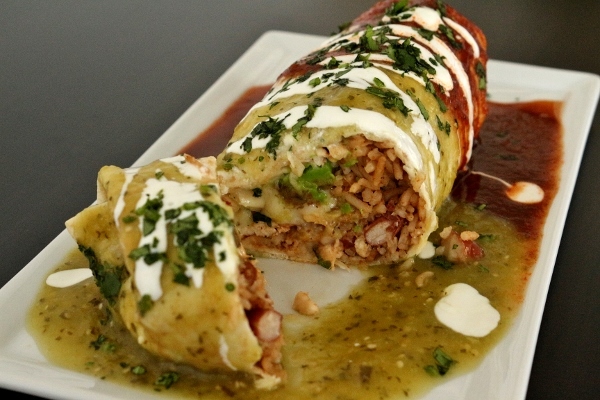 There are so many possibilities for yummy snacks to make for game time, but if you're looking for something a bit more substantial to make it more of a meal, these burritos are what you're looking for. 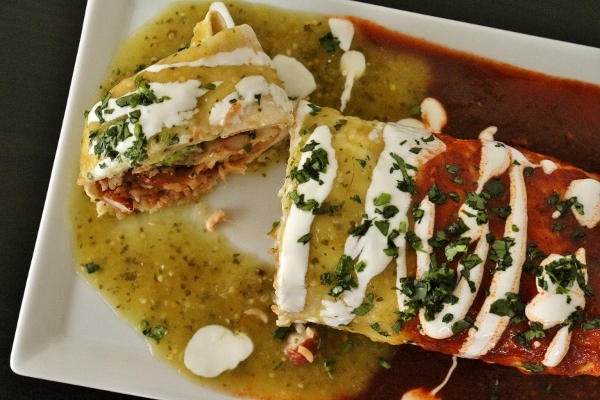 Stuffed with a combination of rice cooked with pinto beans and chili powder, shredded chicken simmered in a chile-infused tomato sauce, avocado, and cheese, and wrapped with a big, fluffy, flour tortilla before baking until heated through, these burritos are exceptional. 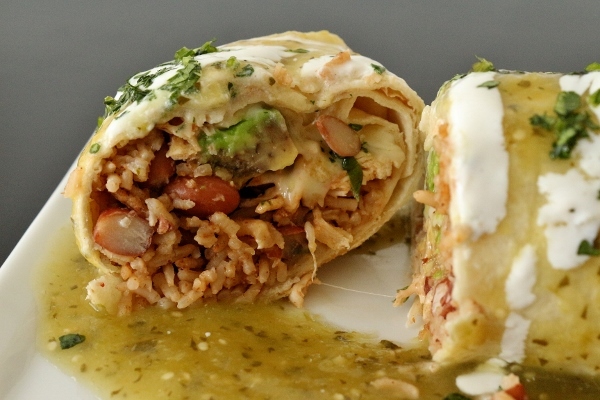 These burritos can be assembled up to an hour ahead of time, so they are perfect for prepping right before the game and then sticking into the oven last minute. 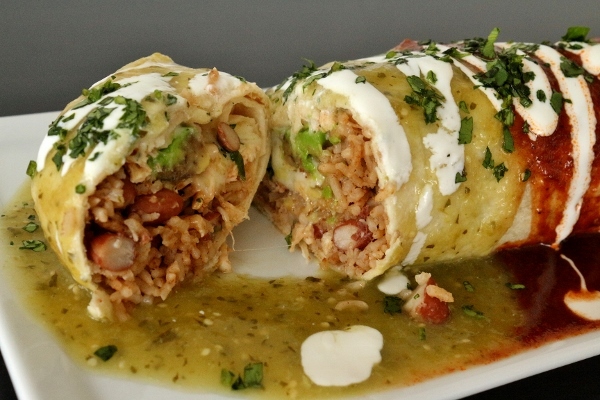 Although the filling boasts the perfect ratio of ingredients, not too much rice, just enough chicken, and a nice blanket of cheese, these burritos become extra special once they get plated. Three sauces are draped over the tops of these bad boys. They symbolize the colors of the Mexican flag with their green, red, and white hues. Green tomatillo salsa (aka salsa verde) is spooned over one half, while the red sauce from stewing the chicken is re-purposed for the other half. A drizzle of Mexican crema brings it all together. I actually thinned out some sour cream with a little milk until it was a nice drizzling consistency. This worked just fine for the task at hand. 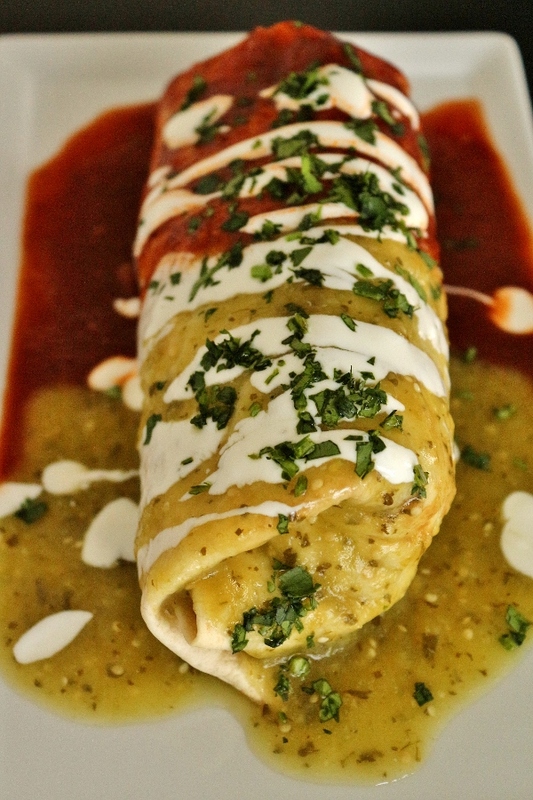 I can't quite put into words how delicious these burritos are, you'll just have to make them yourselves! They appear a little daunting as they require a few steps to make the different components, but it's definitely worth it. They're spicy, and juicy, and smoky, and gooey, and creamy, and chewy, and crispy all at the same time. Whether you whip these up for the big game, or another time for your Sunday supper, you will not be disappointed. I expect these will become a regular occurrence in my home. That's a sure bet. Bring 1 1/4 cups broth, rice, beans, 1 1/2 teaspoons chili powder, and 1/2 teaspoon salt to boil in medium saucepan over medium-high heat. Cover, reduce heat to low, and cook until rice is tender and broth is absorbed, about 20 minutes. Remove rice from heat and let sit, covered, for 10 minutes. Add scallions and fluff with fork to incorporate; cover to keep warm. Meanwhile, cook oil, garlic, and remaining 3 tablespoons chili powder in large saucepan over medium-high heat until fragrant, 1 to 2 minutes. Stir in tomato sauce and remaining 1 cup broth and bring to simmer. Nestle chicken into sauce. Cover, reduce heat to medium-low, and cook until chicken registers 160 degrees F, 10 to 15 minutes, flipping halfway through cooking. Transfer chicken to cutting board and let cool slightly. Using 2 forks, shred chicken into bite-size pieces. Toss chicken with 1/4 cup sauce and 2 tablespoons cilantro in bowl. Set remaining sauce aside. Adjust oven rack to middle position and heat oven to 450 degrees. Line baking sheet with aluminum foil. 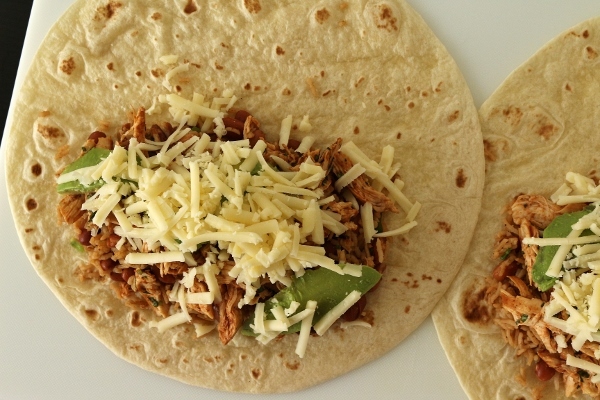 Wrap tortillas in damp dish towel and microwave until warm and pliable, about 1 minute. Lay warm tortillas on counter. 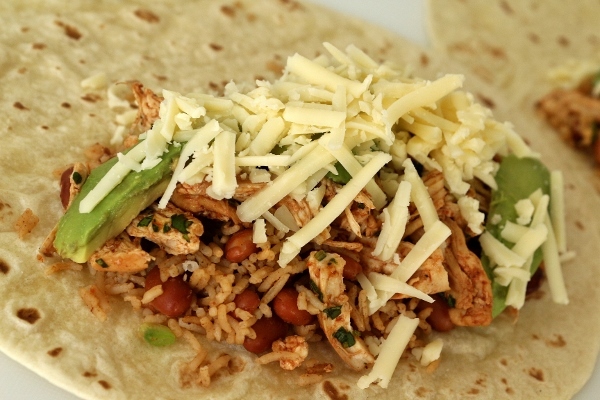 Mound rice in center of tortillas, close to bottom edge, then top with chicken, avocado, and Monterey Jack. 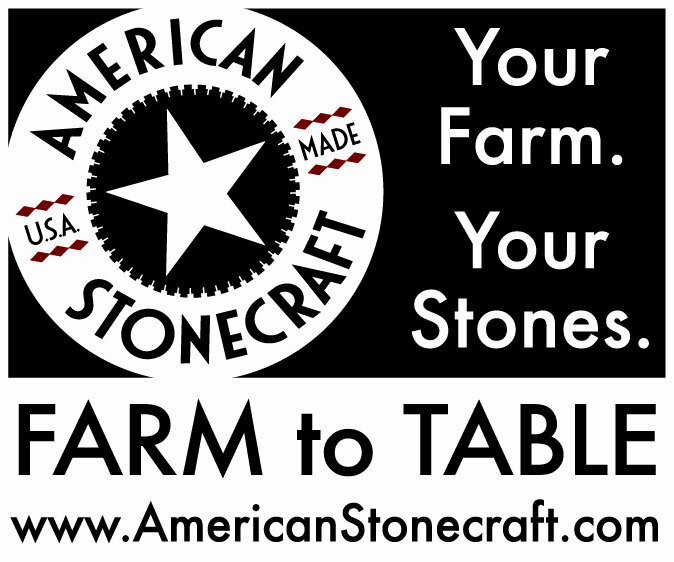 Working with 1 tortilla at a time, fold sides then bottom of tortilla over filling, pulling back on it firmly to tighten it around filling, then continue to roll tightly over burrito. (Burritos can be held at room temperature for up to 1 hour before baking.) 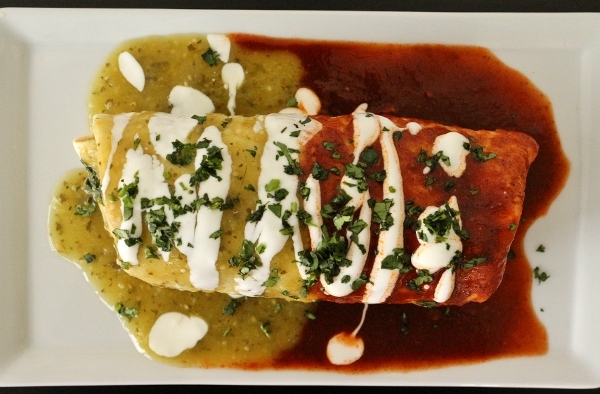 Place burritos seam side down on prepared sheet, cover tightly with foil, and bake until hot throughout, 20 to 30 minutes. Before serving, whisk salsa and 2 tablespoons cilantro together in bowl, cover, and microwave until hot, about 1 minute (if you're using homemade tomatilla salsa with fresh cilantro in it, no need to stir in extra cilantro at this point). Reheat red sauce in saucepan over medium heat until hot, about 3 minutes, adding water as needed to loosen consistency. Arrange burritos on individual plates. 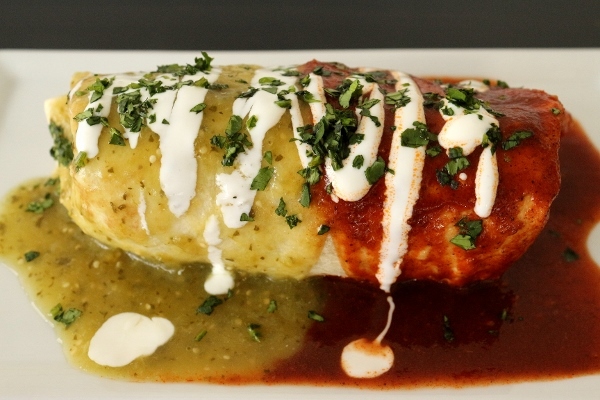 Pour tomatillo sauce over half of each burrito and pour red sauce over other half of burrito. 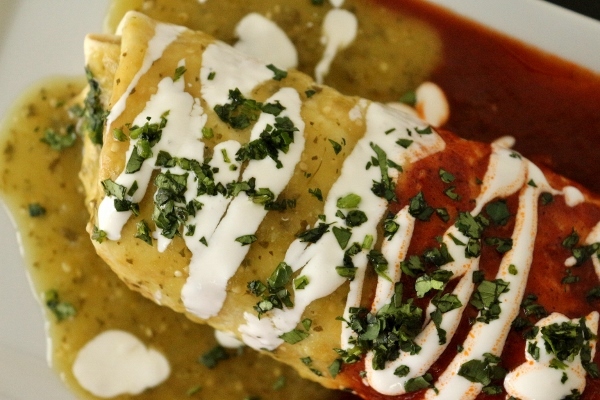 Drizzle with crema, sprinkle with remaining 2 tablespoons cilantro, and serve.